In part two of our SCX10 and SCX10 II SORRCA fitment guide, we’re going to talk external accessories. These are the scale items that are on the outside of the truck that enhance the scale look of the machine like the bumpers and sliders. We know there are plenty of tricks and techniques to do to these components to help improve performance, but remember SORRCA is about scale, so these parts have to follow specific requirements to fit within the rules for competition. SORRCA Rule • Full width bumpers are required on the front and rear of the vehicle. Bumpers that are molded into the body qualify. A rear bumper is not required on a flatbed, but adding one to the flatbed will gain the additional scale points. (Bumpers are measured from the outsides and must be the width of your windshield). 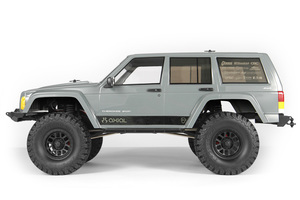 Once again, the Axial SCX10 II with XJ body fits right into SORRCA rules as both its front and rear full width bumpers exceed the width of the windshield. 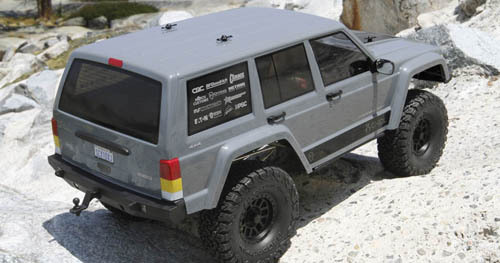 The SCX10 Rubicon however has a front bumper that is narrower than the windshield. If you plan on using the Rubicon and have already updated your right with the CMS as discussed in Part 1 of our SORRCA series, you’ll have to hunt down a bumper option such as the Scale Front Plate Bumper Set (AX80039A) or the JCROffroad Vanguard Front Bumper (AX31392). 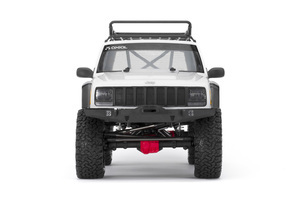 By SORRCA rules, bumpers molded into the body are also considered a legal bumper so if you need to fit your existing rig into this rule, you may want to consider a new body such as the 2015 Ram 2500 Power Wagon® Body (AX31132) or Jeep NuKizer 715 Body (AX31267). These two bodies have both the front and rear bumpers molded into the body and they fit the windshield width rule. SORRCA Rule • Sliders must run parallel to the factory rocker bottom. Many drivers modify their sliders and place them on an angle with the front of the slider being higher than the rear in efforts to glide over obstacles easier. This doesn’t conform to SORRCA rules, however if you are using the complete factory slider set-up on Any Axial SCX10 or SCX10 II without modification, your sliders will be parallel to the factory rockers on your body when it is mounted level. The SCX10 II fits right into SORRCA’s rules pertaining to the bumper and sliders as long as you run your rig as it arrives from the factory. The venerable SCX10 too can easily be brought up to spec with off the shelf parts from Axial. But we have more to cover. Check back for Part 3 of our SORRCA fitment series where we discuss rules for the body.